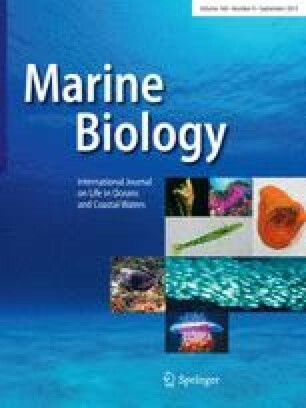 The combined effects of temperature and salinity on embryonic development and on larval survival and growth to setting size of the northerm bay scallop Argopecten irradians irradians (Lamarck) were studied in the laboratory. A 6x6 complete factorial design was used; temperatures ranged from 10° to 35°C, at 5C° intervals, and salinities ranged from 10 to 35‰S, at 5‰S intervals. Response-surface contour diagrams were generated to provide estimates of conditions for optimal responses. Normal development of embryos occurred over a very narrow range of temperature and salinity. Survival of larvae occurred over a wider range of temperature and salinity than did embryonic development or growth of larvae. Satisfactory growth (>70% of the maximum observed value) occurred only at high temperature-high salinity conditions; optimal conditions for survival occurred at similar salinities, but at slightly lower temperatures. Temperatures of 35°C or greater and/or salinities of 10‰S or less were lethal for all life stages studied. Both salinity and temperature exerted significant effects on development and survival, but temperature was clearly the dominant factor influencing growth. It is suggested that northern bay scallop embryos and larvae be reared at their respective optimal temperature-salinity levels so as to increase efficiency of aquaculture operations.